In the beginning, there is raw fish. The fish must be as fresh as you can get it, preferably fish that has just been plucked from the ocean. The right thing when you’re cooking fish, as anybody who’s picked up table utensils will tell you, is to put it on a fire and cook it until it’s done; anything less (sashimi excepted) is asking for trouble. The Filipinos know better. They know that absolutely fresh fish, when bathed in vinegar or calamansi juice, undergoes a cleansing process. The acidic nature of vinegar washes out microorganisms and “cooks” the fish without ridding it of moisture. Combine the lot with salt, chili, and sliced onions, and you have a tart, tender treat with amazingly complementary layers of flavor – salty, fiery, sweet, sour – with room for even more. This is what Filipinos call kinilaw, and don’t let the short name fool you: the dish is as varied as the Philippines’ many islands. The fish, souring agent, and condiments unite to form a common thread, but the patchwork of Filipino cultures do their best to create endless variations on that theme. 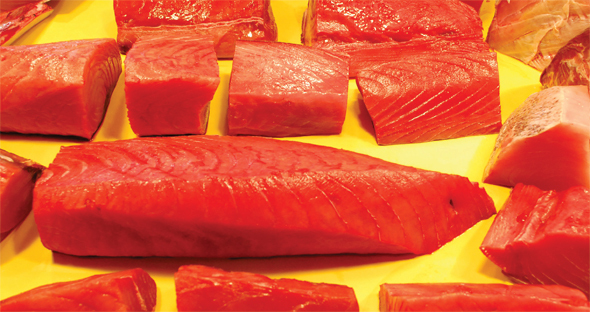 The souring agent may be introduced early in the preparation process, or served on the side with fresh fish slices. Vinegar can be replaced with calamansi juice, since it is said to be better at removing the stronger odor of certain types of fish. Different types of vinegar can be used, to different effects, with cane vinegar and coconut vinegar conjuring quite different flavors. And the fish! Every province swears by kinilaw made from the fish caught in their home waters. 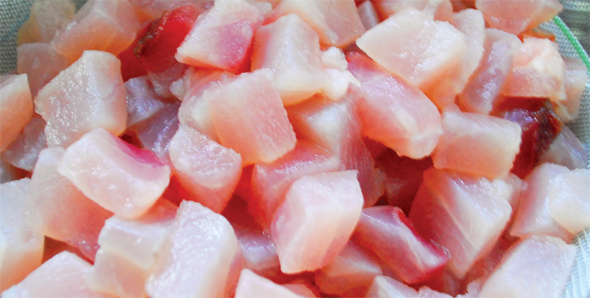 Kinilaw addicts in General Santos City happily chop up bariles, or yellow fin tuna. San Fernando, Pampanga offers visitors a special “jumping salad” or live river shrimp drizzled with calamansi juice. The freshest fish kinilaw yet known is the type called dinagat by Ilonggo fishermen, who take their catch of herring, strip the raw meat off the still-wriggling fish, and salt the meat by dipping it into the sea just before consumption. As varied as kinilaw ingredients and techniques may be, careful cooks know that kinilaw suffers easily with excess. 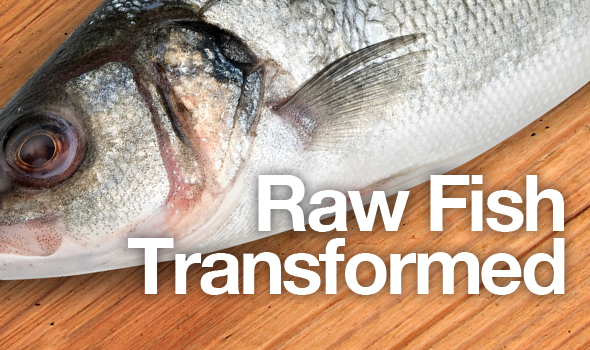 The transformation of the fish should be subtle: the bath of vinegar should give the flesh a hint of opacity and firmness to the bite. If the fish is left to marinate too long in the vinegar, the acids burn into the flesh and leave it stiff, its color an opaque white. The condiments need to be balanced against each other – the salt against the sweet crunch of freshly sliced onions, coconut milk or pork fat to moderate the searing heat of chopped chilies. The different textures of the ingredients complete the layered notes apparent in a dish of kinilaw: fish and the chef’s choice of vegetables both competing and cooperating to deliver a revelation on your palate. There is, as yet, no formula that gets you to the golden mean between flavors and textures. If you’re like Eduardo “Momong” Robillo – a Filipino businessman based in Davao City and a kinilaw artist among his close friends – you learn your craft through painstaking trial, error, and the occasional epiphany. The beer-drinking culture in the Philippines drives innovation forward, which explains why kinilaw seems to be almost exclusively the preserve of men like Mr. Robillo. Kinilaw pairs especially well with beer; it’s eaten mainly as a side dish to a drinking session, rarely as a meal with rice. And with buddies getting together quite often to drink and eat, it’s inevitable that somebody will find an excuse to tinker with the recipe. That “somebody”, for his Davao drinking buddies, was Mr. Robillo, who used his frequent trips to find new twists on his favorite dish. “Whenever we go to a different place – like Cebu, or Cagayan de Oro – we order kinilaw, and I pick up bits and pieces of information,” he tells us. Raw malasugi (swordfish) seems like an unlikely canvas for flavor, but in the hands of dedicated kinilaw artists like Mr. Robillo, raw fish can be spun out into the gastronomical equivalent of all the art in the Louvre. It simmers down to the rest of the palette: vinegar and calamansi juice for souring; sea salt and salted duck egg to balance against the tartness of the acid; black pepper and two types of chili for heat; bell peppers, garlic and onions for taste and texture; and pork belly and coconut milk to take the edge off the chilies and to add roundness to the flavor. The rest of the ingredients follow in quick succession. Making kinilaw is sweaty work – vegetables require chopping into bite-size pieces, the freshly grated coconut must be squeezed to extract the milk, the calamansi must be juiced, a bit of bird’s-eye chili must be mashed into the juice, and the pork belly must be broiled before being chopped into smaller pieces to join the rest. But there’s no cooking (save for the broiled pork belly), and the ingredients are kept as close to a natural state as possible (chopping aside). Mr. Robillo pours the spicy calamansi juice into the mixture of coarsely chopped vegetables, then reaches into the refrigerator and combines the fish with everything else. The result is kinilaw, or one man’s personal vision of it. I notice it’s relatively dry, unlike the Ilonggo-style kinilaw served at the upscale Sagay restaurant in downtown Davao, which is practically swimming in vinegary coconut milk. Neither is it like the stuff they serve at Luz Kinilaw, a popular working-class restaurant near the docks – Luz Kinilaw serves raw bariles with the vinegar on the side, a topping of onion slices, and nothing else. Personal vision in the kitchen can only go so far. At its core, kinilaw is all about nature and a little bit more: raw fish, vinegar, maybe some chopped onions and other vegetables, together with the idea that, certainly, nature can be improved on.